Oy my hand is about to fall off. 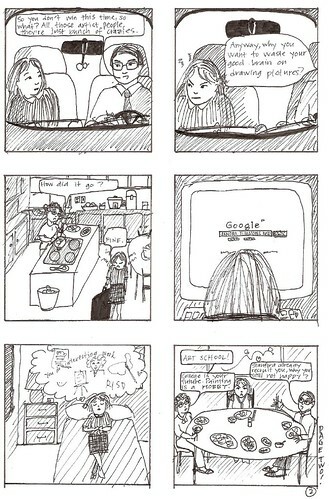 In lieu of a DDP or TWP for today, I present to you page one of my first ever real attempt at drawing a comic. 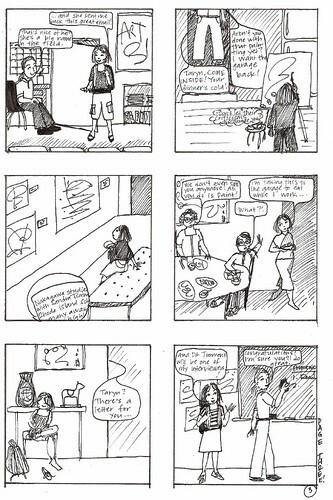 We have a short story assignment due tomorrow in creative writing class, and DWL encouraged me to try a comic, so I did. I spent a long time working on a story, and then realized it wouldn’t work. I’ve progressed a lot as a writer, but I’ve never really attempted a serious story-based comic, so I just wasn’t capable of translating that more complex story into comix. 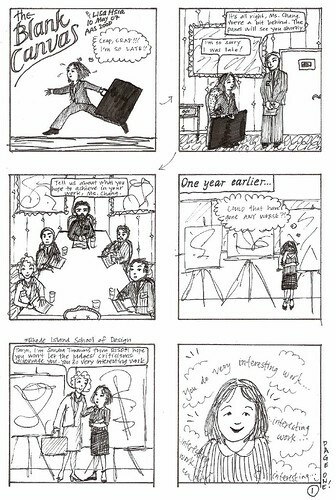 So I gave it up and came up with a much simpler, more focused story instead, to be told over four pages (six panels per page). I’m not sure whether it works, but that’s what we’ll find out next week when the story is up for workshopping. For now: Page One. It is to be admitted that I drastically underestimated the time it would take me to draw this. I forgot how tedious inking panels gets after the first, oh, ONE. I’m now done with two out of the four pages and I am aching all over. Sigh. I’ll scan and post the others as they’re finished, during my breaks (I’m forcing myself to break every time I’ve finished three panels). I wrote something earlier today too, but now I don’t know if I’ll have time/wrists to type that up tonight. We’ll see. Another half hour, another three panels, another page uploaded. Oh, and to keep the continuity of the comic, all future pages will be posted as updates to this entry, NOT as separate entries. So if you think you’ll be checking back for progress as the night goes on, keep faith and scroll down!